Good evening. My name is Dr. Ashley Jackson, and welcome to Electric Lady. Before I begin, there are just a few people that I would like to thank. First, Andrew Cyr, the Artistic Director and visionary of Metropolis Ensemble. I’ve worked with him for about two years now, and it’s an honor to be a part of this innovative series at 1 Rivington. To the composers, for sharing their music with all of us, for giving us performers and listeners the opportunity to create, experience, dream, and imagine through their art. Last, but certainly not least, I want to thank Anna, Jocelin and Simon for their artistry – it has been such a treat for me to work with you on this repertoire, so again, thank you. In looking at how works by female composers are received and reviewed, so powerful is this reception history that it remains a challenge for us to take gender out of the equation when looking at the music. "Do not be cowed by any shaming of the ‘emotional’ or the ‘feminine’ in your work…Demand better. Tell your stories – loud, proud, bold, vulnerable, with the full gamut of your humanity. We’ve got a lot of lost time to make up for, and infinite facets of the female human experience to render." As I was putting tonight’s program together, it turned out that all of the works I wanted to share with you were composed by women. Extraordinary, talented, diverse women. And it was their music that resonated with me first. And so tonight is really about celebrating their work, and the music of one composer in particular, Danielle Eva Schwob. Danielle and I have a hard time remembering the exact year that we met. We just know that “it was some time ago.” For the past several years, it has been a privilege to work closely with her, and get to know her not only as an artist, but also as a dear friend. She never ceases to amaze me, and I can’t think of anyone else who could pull off recording two albums at the same time. You go girl. I always look forward to programming Danielle’s chamber works with harp, for her compositional language has a beautiful way of speaking to audiences, and drawing them into her ostensibly simple, yet intricately expressive soundworld. The six works on the program are grouped in pairs, each played without a pause, and beginning with a composition by Danielle. The first set begins with Shiver, a chamber work for flute, harp, and vibraphone – it’s also the first piece of Danielle’s that I ever played. As the title suggests, the work takes us through various frozen landscapes that are presented in a series of rather distinct musical episodes. The piece opens with fragments of incoherent voices, interspersed between unrelated gestures. These voices gradually become louder until about two minutes in, we arrive at the first discernible phrase, “I found something really cool.” This phrase is the last one that we hear, as if to confirm that we can arrive at the end of our search for something by looking back at events, people, and places that didn’t seem related at the time. Here is Shiver and Technicolor. 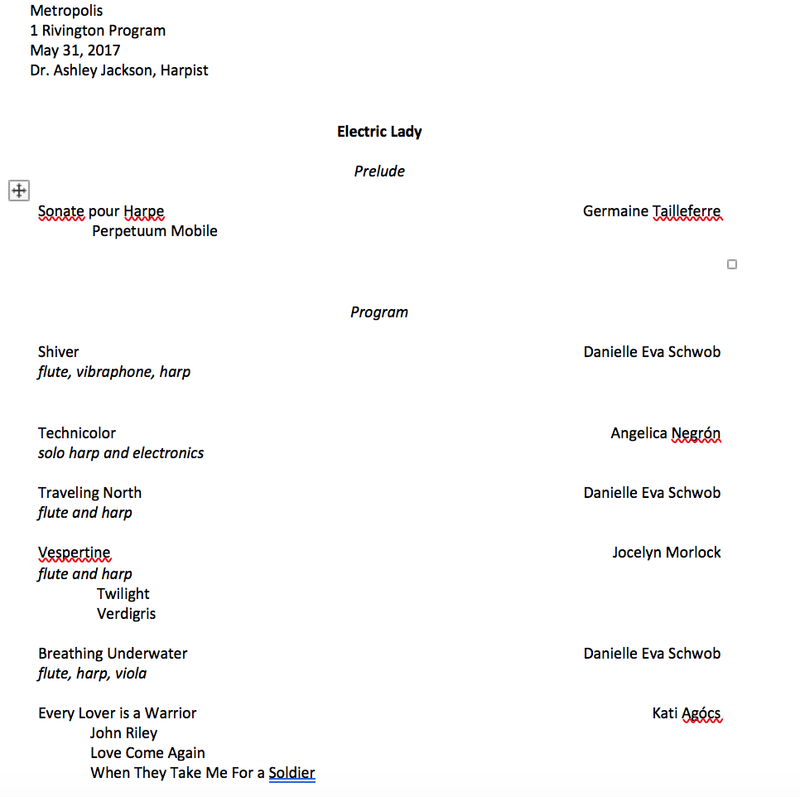 When Danielle and I were brainstorming about the content for tonight’s program, she proposed an arrangement of Traveling North, which is originally scored for flute and vibraphone. When I first sat down with the score, I immediately texted her and said, “D, this is unbelievably gorgeous.” Like Shiver, Traveling North evokes a rather bleak, barren scene. But there’s a greater sense of continuity to the way the music travels through its chilling harmonies, powerfully evoking the icy “Games-of-thrones-esque” forest that inspired the piece. In the next work, the sun begins to set; and “Twilight,” the title for the first movement of Jocelyn Morlock’s Vespertine, is that moment in the day when the sun is just below the horizon, and there’s a soft light in the sky. This glowing light is caused by the refraction and scattering of the sun’s rays from the atmosphere. Structurally, the first movement has a kind of gentle arc. The opening harp solo slowly hovers around just a few pitches, and is eventually joined by low murmurs in the alto flute. The music gradually gains momentum, with the two instruments operating completely independently of one another. As night falls, the music returns to a calmer state, reminiscent of the movement’s opening. The title of the second movement, “Verdigris,” refers to that bright bluish-green color which is formed on copper or brass by the oxidation process. After a meditative and lyrical opening, the harp eventually settles into an ostinato. But, a strange note appears, the color changes, and the harmonic soundscape completely shifts. The movement reaches a gentle climax with bird-like figures in the flute, but overall, the mood of this movement remains quietly introspective, almost like a postlude to the more active first. With its instrumentation, Breathing Underwater is, on some levels, an homage to Debussy’s Sonata for flute, viola, and harp. This influence is also evident in the opening viola solo and pointillistic harp chords that appear later in the piece. As the title suggests, the music seamlessly transitions between moments of stasis and motion. Danielle elaborates: “Breathing Underwater was inspired by my experience visiting China and returning home to New York, as I attempted to evoke a watery scene that feels foreign at first but gradually reveals itself to be serene and welcoming. Kati Agocs wrote Every Lover is a Warrior in collaboration with harpist Bridget Kibbey, and it is based on traditional folk songs from three different countries. The first is an Appalachian tune called John Riley. In the song, a soldier comes home from war, and asks his love for her hand in marriage. But, she doesn’t recognize him, and says no, she is waiting for John Riley. Finally, at the end of the song, he reveals his identity, saying “weep no more, my own true love, I am your long-lost John Riley.” Love turns spiritual in the second movement, which is based on a French hymn. The third movement combines two Hungarian folk songs. In one of them, a soldier laments having to be sent off to war, rather than stay at home with his love. The powerful themes of love and war run throughout this suite, asserting that perhaps, the true warriors are the ones who hold onto love. Thank you all for coming out tonight, and here is Breathing Underwater and Every Lover is A Warrior.